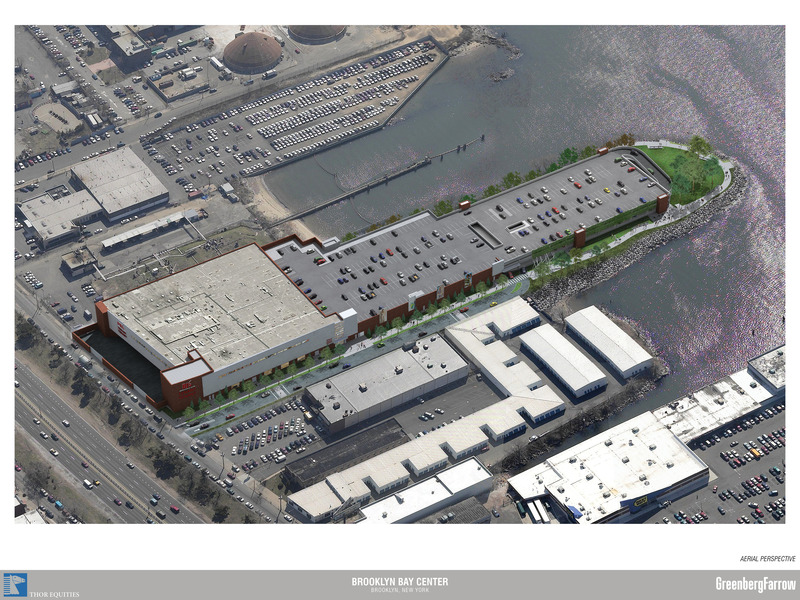 Proposed shopping center on Gravesend Bay. Image: Courtesy of GreenbergFarrow. Two-story retail complex on Gravesend Bay peninsula will feature BJ’s Wholesale Club. On September 21, 2011, the City Council approved Thor Equities LLC’s proposal to build a two-story retail development at 1752 Shore Parkway in the Gravesend section of Brooklyn. The 1,200-foot long project will be located on a peninsula in Gravesend Bay adjacent to the Belt Parkway. The 214,000 sq.ft. complex will include a three-level, 690-space parking garage and a 103,000 sq.ft. public waterfront esplanade. Thor Equities plans to lease the property to BJ’s Wholesale Club, which will then develop the site. BJ’s plans to occupy the complex’s ground-floor space and lease the second-floor space to smaller retail tenants. The site was zoned as an M3-1 manufacturing district, and existing nearby commercial uses operate pursuant to BSA variances. Thor Equities submitted multiple applications, including a request to rezone the peninsula to an M1-1 district and for a special permit to build a retail use in a manufacturing district. Brooklyn Community Board 11 and Borough President Marty Markowitz supported the proposal, but requested that Thor Equities implement traffic mitigation measures and give hiring preferences to local residents. CB 11 also requested that Thor Equities provide a public dock to access Gravesend Bay, while Markowitz requested that customers of adjacent businesses be permitted to use the project’s proposed garage. At the City Planning Commission’s hearing, urban planner Ethan Goodman testified that Thor Equities had agreed to most of CB 11 and Markowitz’s conditions, but could not provide the dock because of permit issues. No one spoke in opposition. 8 City- Land 105 (Aug. 15, 2011). The Commission unanimously approved the proposal, noting that the project would revitalize the underutilized site and provide the public with new waterfront access. At the Council’s Zoning & Franchises Subcommittee hearing on September 15, 2011, no one opposed the project. Attorney Jesse Masyr, representing Thor Equities, testified that the proposal would lead to the environmental remediation of the contaminated site, and stated that “under no circumstances will [the project] ever be a Wal-Mart.” In response to concerns expressed by local Council Member Domenic M. Recchia Jr., Patrick Smith, representing BJ’s, stated that the project would be built with “100 percent union labor.” Smith also testified that BJ’s would hire locally and would consider the local workforce groups recommended by Recchia. The Subcommittee, Land use Committee, and full Council unanimously approved the project. Council: Brooklyn Bay Center (September 21, 2011) (Architect: GreenbergFarrow).